Color later tonight (Friday). Some things came up ranging from getting home late, to being in a concert all week, to needing a shower and some other things that took priority so you’ll have to do with an ink for now. Apologies! On another note, Lancelot’s hair is fun to draw. It’s all wavy and stuff. Oh! And there’s a bunch of new fanart up if you care to check that out. ….Mordred really hates alot of food, eh? All villains are picky, didn’t you know that? Ah, dang. It was your next symphony concert this week, wasn’t it? *Kicks self. * I meant to attend. Sorry. *Chuckles. * Lancelot looks woozy… I can already see hearts and bubbles floating around his head. He might even be hearing bells. “Chuch bells may ring/And surely darling the angels will sing./I’ll tell you darling,/You’re the queen of my throne./You should have known, sweetheart.” –The Diamonds. :cool: Too many great songs fit his situation right now. Hurrah for strips with TWO punchlines! Oh, no. XD I already had my concert…it was a couple weeks ago. Sorry; I didn’t tell anybody about that one. …heh. While we’re on the subject, why doesn’t Driver like Lancelot? We’ve already seen that she’s willing to date people other than Mordred, and that she hasn’t had much luck with romance before, and Lancelot’s not THAT bad looking. Not that it’s unrealistic or anything, I’m just genuinely curious. What is it about him that makes her disinterested? Yay, a date! 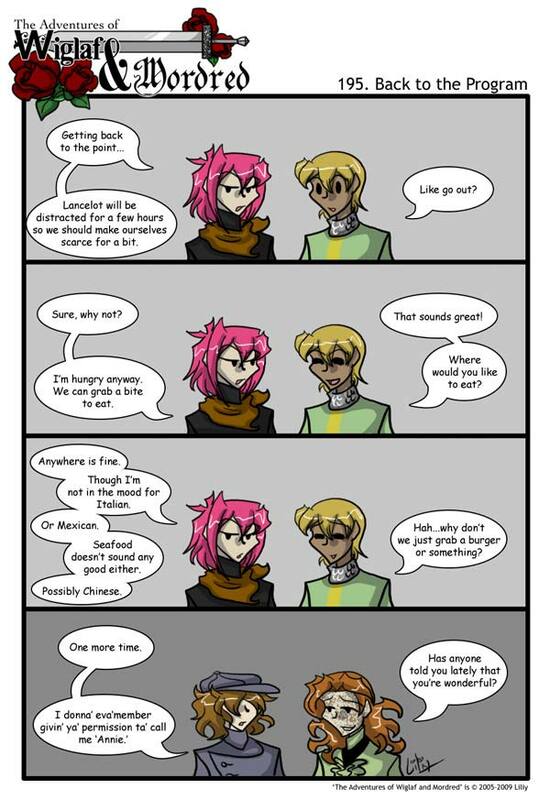 =D Burgers isn’t very romantic, though…>.> I bet Mordred is just doing that on purpose!